An aggravated member of the Hokitika Literary Institute wrote this letter to the West Coast Times in 1889. 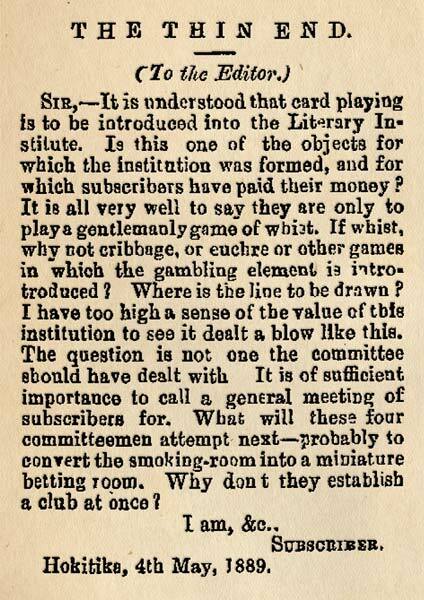 'Subscriber' was objecting to the institute's decision to allow the card game whist to be played on the premises. The letter's final sentence suggests that the introduction of this game was a step towards converting the literary institute (a forerunner of a public library) into a gentlemen's club. In such clubs, gambling on cards was a popular activity, but other citizens strongly disapproved of it. Although the literary institute's committee had only approved the 'gentlemanly' and non-gambling game of whist, 'Subscriber' saw this as a dangerous precedent.